"Wyandots", "Wendats", and "Hurons" redirect here. For other uses, see Wyandot (disambiguation), Wendat (disambiguation), and Huron (disambiguation). By the 15th century, the pre-contact Wyandot had settled in the large area from the north shores of most of present-day Lake Ontario, northwards up to Georgian Bay. From this homeland, they encountered the French explorer Samuel de Champlain in 1615. The historical Wyandot emerged in the late 17th century from the remnants of two earlier groups: the Wyandot (Huron) Confederacy and the Tionontati (Petun in French, also known as the Tobacco people for their chief commodity crop). They were located in the southern part of what is now the Canadian province of Ontario around Georgian Bay. Drastically reduced in number by epidemic diseases after 1634, they were dispersed by war in 1649 from the Iroquois (Haudenosaunee), then based in New York. Today the Wyandot have a First Nations reserve in Quebec, Canada. They also have three major settlements in the United States, two of which are organized as independently governed, federally recognized tribes. Due to differing development of the groups, they speak distinct forms of Wendat and Wyandot languages. Main body of Georgian Bay highlighted on the map of the Great Lakes directly above Lake Ontario, with its outlet on the Saint Lawrence River. This is where the Huron encountered the French. Early theories placed Huron origin in the St. Lawrence Valley, with some arguing for a presence near present-day Montreal and former sites of the historic St. Lawrence Iroquoian peoples. Wendat is an Iroquoian language. Early 21st-century research in linguistics and archaeology confirm an historical connection between the Huron and the St. Lawrence Iroquois. 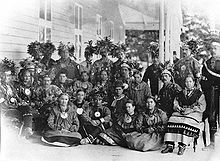 But all of the Iroquoian-speaking peoples shared some aspects of their culture, including the Erie people, any or all of the later Six Nations of the Iroquois, or the defunct Susquehannock tribe. Indeed, there is now every indication that the late precontact Huron and their immediate antecedents developed in a distinct Huron homeland in southern Ontario along the north shore of Lake Ontario. Subsequently they moved from there to their historic territory on Georgian Bay, where they were encountered by Champlain in 1615. In the early 17th century, this Iroquoian people called themselves the Wendat, an autonym which means "Dwellers of the Peninsula" or "Islanders". The Wendat historic territory was bordered on three sides by the waters of Georgian Bay and Lake Simcoe. Early French explorers referred to these natives as the Huron, either from the French huron ("ruffian", "rustic"), or from hure ("boar's head"). According to tradition, French sailors thought that the bristly hairstyle of Wendat warriors resembled that of a boar. French fur traders and explorers called them the "bon Iroquois" (good Iroquois). An alternate etymology from Russell Errett in 1885 is that the name is from the Iroquoian name Irri-ronon ("Cat Nation"), a name also applied to the Erie nation. They pronounced the name as Hirri-ronon in French, which gradually was known as Hirr-on, and finally spelled in its present form, Huron. William Martin Beauchamp concurred in 1907 that Huron was at least related to the Iroqouian root ronon ("nation"). Other etymological possibilities come from the Algonquin words ka-ron ("straight coast") or tu-ron ("crooked coast"). The Wendat were not a tribe, but a confederacy of four or more tribes who had mutually intelligible languages. According to tradition, this Wendat (or Huron) Confederacy was initiated by the Attignawantans ("People of the Bear") and the Attigneenongnahacs ("People of the Cord"), who made their alliance in the 15th century. They were joined by the Arendarhonons ("People of the Rock") about 1590, and the Tahontaenrats ("People of the Deer") around 1610. A fifth group, the Ataronchronons ("People of the Marshes or Bog"), may not have attained full membership in the confederacy, and may have been a division of the Attignawantan. The largest Wendat settlement, and capital of the confederacy, was located at Ossossane. Modern-day Elmvale, Ontario developed near that site. They called their traditional territory Wendake. Tuberculosis (TB) was endemic among the Huron, aggravated by the close and smoky living conditions in the longhouses. Despite this, the Huron on the whole were healthy; the Jesuits wrote that the Huron effectively employed natural remedies and were "more healthy than we." The earliest written accounts of the Huron were made by the French, who began exploring North America in the 16th century. News of the Europeans reached the Huron, particularly when Samuel de Champlain explored the Saint Lawrence River in the early 17th century. Some Huron decided to go and meet the Europeans. Atironta, the principal headman of the Arendarhonon tribe, went to Quebec and made an alliance with the French in 1609. They are robust, and all are much taller than the French. 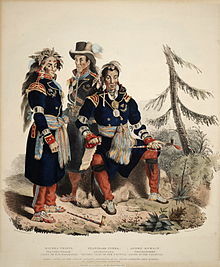 Their only covering is a beaver skin, which they wear upon their shoulders in the form of a mantle; shoes and leggings in winter, a tobacco pouch behind the back, a pipe in the hand; around their necks and arms bead necklaces and bracelets of porcelain; they also suspend these from their ears, and around their locks of hair. They grease their hair and faces; they also streak their faces with black and red paint. The total population of the Huron at the time of European contact has been estimated at about 20,000 to 40,000 people. From 1634 to 1640, the Huron were devastated by Eurasian infectious diseases, such as measles and smallpox which were endemic among the Europeans. The peoples of North America had no acquired immunity to these diseases and suffered very high mortality rates. Epidemiological studies have shown that beginning in 1634, more European children emigrated with their families to the New World from cities in France, Britain, and the Netherlands, which had endemic smallpox. Historians believe the disease spread from the children to the Huron and other nations, often through contact with traders. So many Huron died that they abandoned many of their villages and agricultural areas. About half to two-thirds of the population died in the epidemics, decreasing the population to about 12,000. Such losses had a high social cost, devastating families and clans, and disrupting their society's structure and traditions. Before the French arrived, the Huron had already been in conflict with the Haudenosaunee Confederacy (Five Nations) to the south. Several thousand Huron lived as far south as present-day central West Virginia along the Kanawha River by the late 16th century, but they were driven out by the Haudenosaunee, who invaded from present-day New York in the 17th century to secure more hunting grounds for the beaver trade. Once the European powers became involved in trading, the conflict among natives intensified significantly as they struggled to control the lucrative fur trade and satisfy European demand. The French allied with the Huron, because they were the most advanced trading nation at the time. The Haudenosaunee tended to ally with the Dutch and later English, who settled at Albany and in the Mohawk Valley of their New York territory. Introduction of European weapons and the fur trade increased competition and the severity of inter-tribal warfare. While the Haudenosaunee could easily obtain guns in exchange for furs from Dutch traders in New York, the Wendat were required to profess Christianity to obtain a gun from French traders in Canada. Therefore, they were unprepared, on March 16, 1649, when a Haudenosaunee war party of about 1000 entered Wendake and burned the Huron mission villages of St. Ignace and St. Louis in present-day Simcoe County, Ontario, killing about 300 people. 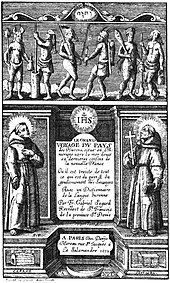 The Iroquois also killed many of the Jesuit missionaries, who have since been honored as North American Martyrs. The surviving Jesuits burned the mission after abandoning it to prevent its capture. The extensive Iroquois attack shocked and frightened the surviving Huron. By May 1, 1649, the Huron burned 15 of their villages to prevent their stores from being taken and fled as refugees to surrounding tribes. About 10,000 fled to Gahoendoe (now also called Christian Island). Most who fled to the island starved over the winter, as it was an unproductive settlement and could not provide for them. After spending the bitter winter of 1649–50 on the island, surviving Huron relocated near Quebec City, where they settled at Wendake. Absorbing other refugees, they became the Huron-Wendat Nation. Some Huron, along with the surviving Petun, whose villages the Iroquois attacked in the fall of 1649, fled to the upper Lake Michigan region, settling first at Green Bay, then at Michilimackinac. THESE are to certify that the CHIEF of the HURON tribe of Indians, having come to me in the name of His Nation, to submit to His BRITANNICK MAJESTY, and make Peace, has :been received under my Protection, with his whole Tribe; and henceforth no English Officer or party is to molest, or interrupt them in returning to their Settlement at LORETTE; :and they are received upon the same terms with the Canadians, being allowed the free Exercise of their Religion, their Customs, and Liberty of trading with the English: – :recommending it to the Officers commanding the Posts, to treat them kindly. Given under my hand at Longueil, this 5th day of September 1760. The treaty recognized the Huron-Wendat as a distinct nation and guaranteed that the British would not interfere with the Huron-Wendat's internal affairs. In 1990, the Supreme Court of Canada ruled in R v Sioui found that the Huron-British Treaty of 1760 was still valid and binding on the Crown. Accordingly, the exercise of Huron-Wendat religion, customs, and trade benefit from continuing Canadian constitutional protection throughout the territory frequented by the Huron-Wendat at the time the treaty was concluded. William Walker (1800–1874), a leader of the Wyandot people and a prominent citizen in early-day Kansas. In the late 17th century, elements of the Huron Confederacy and the Petun joined together and became known as the Wyandot (or Wyandotte), a variation of Wendat. (This name is also related to the French transliteration of the Mohawk term for tobacco.) The western Wyandot re-formed in the area of Ohio and southern Michigan in the United States. In August 1782, the Wyandot joined forces with Simon Girty, a British soldier. On Aug 15–19, 1782, they unsuccessfully besieged Bryan Station in Kentucky (near present-day Lexington). They drew the Kentucky militia to Lower Blue Licks, where the Wyandot defeated the militia led by Daniel Boone. The Wyandot gained the high ground and surrounded Boone's forces. Also in late 1782 the Wyandot joined forces with Shawnee, Seneca, and Delaware Indians in an unsuccessful siege of Fort Henry on the Ohio River. During the Northwest Indian War, the Wyandot fought alongside British allies against the United States. Under the leadership of Tarhe, they were signatories to the Treaty of Greenville in 1795. In 1807, the Wyandot joined three other tribes – the Odawa, Potawatomi, and Ojibwe people – in signing the Treaty of Detroit, which resulted in a major land cession to the United States. This agreement between the tribes and the Michigan Territory (represented by William Hull) ceded to the United States a part of their territory in today's Southeastern Michigan and a section of Ohio near the Maumee River. The tribes were allowed to keep small pockets of land in the territory. The Treaty of Brownstown was signed by Governor Hull on November 7, 1807 and provided the Indian Nations with a payment of $10,000 in goods and money along with an annual payment of $2,400 in exchange for an area of land that included the southeastern one-quarter of the lower peninsula of Michigan. In 1819, the Methodist Church established a mission to the Wyandot in Ohio, its first to Native Americans. In the 1840s, most of the surviving Wyandot people were displaced to Kansas Indian Territory through the US federal policy of forced Indian removal. Using the funds they received for their lands in Ohio, the Wyandot purchased 23,000 acres (93 km2) of land for $46,080 in what is now Wyandotte County, Kansas from the Delaware (Lenape). The Lenape had been grateful for the hospitality which the Wyandot had given them in Ohio, as the Lenape had been forced to move west under pressure from Anglo-European colonists. The Wyandot acquired a more-or-less square parcel north and west of the junction of the Kansas River and the Missouri River. A United States government treaty granted the Wyandot Nation a small portion of fertile land located in an acute angle of the Missouri River and Kansas River, which they purchased from the Delaware in 1843. In addition, the government granted 32 "floating sections", located on public lands west of the Mississippi River. In June 1853, Big Turtle, a Wyandot chief, wrote to the Ohio State Journal regarding the current condition of his tribe. The Wyandot had received nearly $127,000 for their lands in 1845. Big Turtle noted that, in the spring of 1850, the tribal chiefs retroceded the granted land to the government. They invested $100,000 of the proceeds in 5% government stock. After removal to Kansas, the Wyandot had founded good libraries along with two thriving Sabbath schools. They were in the process of organizing a division of the Sons of Temperance and maintained a sizable temperance society. Big Turtle commented on the agricultural yield, which produced an annual surplus for market. He said that the thrift of the Wyandot exceeded that of any tribe north of the Arkansas line. According to his account, the Wyandot nation was "contented and happy", and enjoyed better living conditions in the Indian Territory than they had in Ohio. By 1855 the number of Wyandot had diminished to 600–700. On August 14 of that year, the Wyandot Nation elected a chief. The Kansas correspondent of the Missouri Republican reported that the judges of the election were three elders who were trusted by their peers. The Wyandot offered some of the floating sections of land for sale on the same day at a price of $800. A section was composed of 640 acres (2.6 km2). Altogether 20,480 acres (82.9 km2) were sold for $25,600. They were located in Kansas, Nebraska, and unspecified sites. Surveys were not required, with the title becoming complete at the time of location. The Wyandot played an important role in the politics of Kansas. On July 26, 1853, William Walker, a Wyandot, was elected provisional governor of Nebraska Territory (which included Kansas) at a meeting at the Wyandot Council house in Kansas City. He was elected by Wyandot, white traders, and outside interests who wished to preempt the federal government's organization of the territory and to benefit from settlement of Kansas by white settlers. Walker and the others were promoting Kansas as the route for the proposed transcontinental railroad. Although the federal government did not recognize Walker's election, the political activity prompted the federal government to pass the Kansas–Nebraska Act to organize Kansas and Nebraska territories. An October 1855 article in The New York Times reported that the Wyandot were free (that is, they had been accepted as US citizens) and without the restrictions placed on other tribes. Their leaders were unanimously pro-slavery, which meant 900 or 1,000 additional votes in opposition to the Free State movement of Kansas. In 1867, after the American Civil War, additional members removed from the Midwest to Oklahoma. Today more than 4,000 Wyandot can be found in eastern Kansas and Oklahoma. The last of the original Wyandot of Ohio was Margaret "Grey Eyes" Solomon, known as "Mother Solomon". The daughter of Chief John Grey Eyes, she was born in 1816 and departed Ohio in 1843. By 1889 she had returned to Ohio, when she was recorded as a spectator to the restoration of the Wyandot's "Old Mission Church", a Wyandot Mission Church at Upper Sandusky. She died in Upper Sandusky on August 17, 1890. The last Wyandot to live in Ohio was Bill Moose (1836–1937). Some descendants of the Wyandot Nation of Anderdon live in Ohio and Michigan. Others live in Toronto and Brantford, Ontario, on the Six Nations Reserve. There they have intermarried with the Cayuga and other indigenous peoples. Federally recognized tribes are located in Oklahoma and Kansas of the United States. Beginning in 1907, archaeological excavations were conducted at the Jesuit mission site near Georgian Bay. The mission has since been reconstructed as Sainte-Marie among the Hurons, a living museum that is adjacent to the Martyrs' Shrine. This Roman Catholic shrine is consecrated to the ten North American martyrs. A program founded in the 1940s in the United States attempted to address grievances filed by various Native American tribes; it set up the Court of Indian Claims to adjudicate claims and Congress allocated $800 million to compensate tribes for losses due to treaties broken by the government, or by losses of land due to settlers who invaded their territories. The Wyandot filed a land claim for compensation due to the forced sale of their land to the federal government under the 1830 Indian Removal law, which required Native Americans to move west of the Mississippi River. Originally the United States paid the Wyandot for their land at the rate of 75 cents per acre, but the land was worth $1.50 an acre. Although Congress intended to have a deadline by which Indian claims had to be settled, Federal district courts continued to hear land claim and other cases for compensation. In February 1985 the U.S. government finally agreed to pay descendants of the Wyandot $5.5 million to settle the tribe's outstanding claim. The decision settled claims related to the 143-year-old treaty. In 1842 the United States had forced the tribe to sell their Ohio lands for less-than-fair value. A spokesman for the Bureau of Indian Affairs said that the government would pay $1,600 each, in July 1985, to 3,600 people in Kansas and Oklahoma who could prove they were descendants of Wyandot affected by Indian removal. On August 27, 1999, representatives of the far-flung Wyandot bands of Quebec, Kansas, Oklahoma and Michigan gathered at their historic homeland in Midland, Ontario. They formally re-established the Wendat Confederacy. The Wyandotte Nation is headquartered in Wyandotte, Oklahoma, and in 2011 had 4,957 enrolled members. The Huron-Wendat Nation is based in Wendake, now within the Quebec City limits, and it has approximately 3,000 members. They are primarily Catholic in religion and speak French as a first language. They have begun to promote the study and use of the Wyandot language among their children. For many decades, a leading source of income for the Wyandot of Quebec has been selling pottery, traditional-pattern snowshoes, summer and winter moccasins, and other locally produced crafts. The Wyandot Nation of Kansas has had legal battles with the Wyandotte Nation of Oklahoma over the fate of the Huron Cemetery in Kansas City, Kansas. Listed on the National Register of HIstoric Places because of its significance, it has been a point of contention for more than a century. Because of complications during the Indian removal process, the land continued to be under legal control of the federally recognized Wyandotte Nation of Oklahoma, made up of people who had left Kansas. They have expressed interest in redeveloping the land occupied by the historic cemetery and moving the graves for reinterment, in order to provide for the benefit of its people. Members of the local Kansas Wyandot, many of whom have had family members buried at the historic cemetery, have strongly opposed most such proposals. Redevelopment would require reinterment of Wyandot and other Indian remains, including many of their direct ancestors. In 1998, the two groups finally agreed to preserve the cemetery in Kansas City for religious, cultural and other uses appropriate to its sacred history and use. Like other Iroquoian peoples, the Huron were farmers who supplemented their diet with hunting and fishing. The women cultivated several varieties of maize (corn), squash and beans (the "Three Sisters") as the mainstay of the tribal diet, saving seeds of various types and working to produce the best crops for different purposes. They also collected nuts, fruit and wild root vegetables. Their preparation of this produce was supplemented primarily by fish caught by the men. The men also hunted deer and other animals available during the game seasons. Women did most of the crop planting, cultivation, and processing, although men helped in the heaviest work of clearing the fields. This was usually done by the slash-and-burn method of clearing trees and brush. Men did most of the fishing and hunting, and constructed the houses, canoes, and tools. Each family owned a plot of land which they farmed; this land reverted to the common property of the tribe when the family no longer used it. The Huron lived in villages spanning from one to ten acres (40,000 m²), most of which were fortified in defense against enemy attack. They lived in longhouses, similar to other Iroquoian cultural groups. The typical village had 900 to 1,600 people organized into 30 or 40 longhouses. Villages were moved about every ten years as the soil became less fertile and the nearby forest – from which they took firewood – grew thin. The Huron engaged in trade with neighboring tribes, notably for tobacco with the neighboring Petun and Neutral nations. The Huron way of life is very gender-specific in practice. Men in most societies are the hunters of the tribe; they search for game to feed their people. Women made the clothes, cooked and processed game, farmed, and raised the children. Pregnancy for women has its hardships. Women lock themselves in the woods inside a hut to keep pregnancy localized; traditionally only mothers and grandmothers see the women during labor to see how she is doing. Pregnant women deal with the pregnancy and birth with the help of other women while the men go along their day as if nothing else is happening. They are more pleased with the birth of a girl than that of a boy, as they believe she will guarantee the future of the people by bearing children. Women are given more praise for giving birth to girls. Like other Iroquoian peoples, the Wyandot had a matrilineal kinship system, and children were considered born to the mother's family. They took their status from hers; her older brother would be more important to her sons than their biological father. As children grow older, they slowly grow into their roles within their society. Both genders learn from adults how to do certain things that later will help the tribe. For example, girls learn how to make doll clothing, which teaches them how to make real garments. Boys are given miniature bows so they may practice hunting very small game. Children at young ages are integrated into society evenly. They are given small tasks to follow based on their age. Boys practice hunting and follow men on some hunting events. Having boys follow the men into hunting events lets them learn firsthand how to hunt, receive tips on what to do while hunting, and gain experience for developing needed skills when they are older. Girls learn the same way. They watch the women conduct their daily routines and mimic them on a smaller scale. Having a little girl make the clothes for her doll is preparation for her to make clothing as a young woman and or married mother. Champlain made mortal enemies with the Iroquois when he fought alongside the Huron people. Souring a relationship between the French people that hadn't even started yet for nearly one hundred years; however, he was also trying to make peace between the two tribes (Huron and Iroquois). ^ The American Heritage Book of Indians states the Wyandot name may have evolved after the union of the two related peoples, the Tobacco (Petun) and the Huron, who consolidated after the mid-17th-century Iroquois invasions and conquests. The American Heritage editors also imply the Tobacco people were directly and closely related to the Huron, a probable splinter colony spawned off from the four main tribes of the Huron/Wyandot. ^ The American Heritage Book of Indians editors write that the Huron suffered a sneak attack during the depths of winter in March 1649, when the Iroquois had established a war camp within Huron territory. The Iroquois attacked with more than 1,000 warriors, completely destroying two Huron towns, and severely damaging most of a third. When other Huron villages learned about this, they panicked, fleeing their homeland and moving west. In the event, the northern shore of Lake Ontario came under the control of the Iroquois. They continued with the Beaver Wars, attacking and defeating the Tobacco, Neutral, and Erie peoples in western Pennsylvania and beyond. ^ Note: Both the Draper Site, near Pickering, Ontario and the larger Mantle Site villages are also in territory that may be either the Neutral people or Tobacco people's lands. Both have been hypothesized as near relatives of the Huron, especially the Tobacco people, who also occupied the western 65 miles (105 km) stretch of the south shore of Lake Ontario—and whose remnants are known to have consolidated populations with the Huron, developing as the Wyandot. ^ Some Iroquoian longhouses were over 100 feet (30.5 m) in length, and 80 feet (24 m) was common. ^ Archeological Services, Inc., Mantle Site Archived March 10, 2012, at the Wayback Machine; see also the entries for the Aurora (Old Fort) and Ratcliff Wendat ancestral village sites in Whitchurch-Stouffville. ^ James F. Pendergast, "The Confusing Identities Attributed to Stadacona and Hochelaga"[permanent dead link], Journal of Canadian Studies 32.4, Winter 1997/1998, pp. 149–167, accessed May 10, 2018. ^ Vogel, Virgil (1986). Indian Names in Michigan. Ann Arbor: University of Michigan Press, 1986. p. 12. ^ Hey, Chester Andrew; Eckstein, Norman (1959). Huron County Centennial History, 1859-1959: Hi-lights in 100 Years of Progress. Harbor Beach Times. The Indian language contained the word, Ka-ron, straight coast or shore, and Tu-ron, a crooked or winding coast. ^ a b c d e f Dickason, "Huron/Wyandot", 263–65. ^ Trigger, Children of Aataentsic, 30. ^ a b c d Gary Warrick, "European Infectious Disease and Depopulation of the Wendat-Tionontate (Huron-Petun)", World Archaeology 35 (October 2003), 258–275. ^ Labelle, Kathryn Magee (Autumn 2009). ""They Only Spoke in Sighs": The Loss of Leaders and Life in Wendake, 1633-1639" (PDF). Journal of Historical Biography. 6: 1–33. ^ Jaenen, Cornelius J. "Murray Treaty of Longueuil, 1760"
^ "Brownstown History - Brownstown History". sites.google.com. Retrieved January 25, 2019. ^ Weslager, C. A. (1972). The Delaware Indians: A History. Rutgers University Press, pp. 399–400. ISBN 0-8135-0702-2. ^ "Wyandot Indians holding an Election-Their Land Claims", The New York Times, August 24, 1855, p. 2. ^ "Affairs In Kansas", The New York Times, October 2, 1855, p. 2. ^ a b 2011 Oklahoma Indian Nations Pocket Pictorial Directory. Archived May 12, 2012, at the Wayback Machine Oklahoma Indian Affairs Commission. 2011: 39. Retrieved April 30, 2013. Wikimedia Commons has media related to Huron. Jones, Arthur Edward (1913). "Huron Indians" . Catholic Encyclopedia. "Wyandot" . Encyclopædia Britannica (11th ed.). 1911.